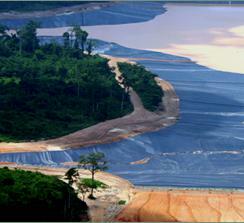 Geomembranes are the most widely used products for solid waste, mining and water containment applications. GSE uses the highest quality resins to manufacture the widest selection of high density polyethylene (HDPE) and linear low density polyethylene (LLDPE) geomembrane products available in either a black, green, white or Conductive upper surface, and in either a smooth or textured single or double-sided surface. GSE geomembrane specifications meet or exceed GRI GM13. GSE HDPE Smooth geomembranes are the preferred products for lining projects requiring low permeability, exceptional chemical and ultraviolet resistance properties, which makes them an extremely cost-effective product for many applications. GSE HDPE Textured geomembranes are available with either single or double sided textured with superior shear strength and the highest multi-axial performance offered in the market. Our products have a proven history of success in many lining applications. GSE LLDPE Smooth geomembranes are designed for waste containment applications that require greater flexibility and elongation performance. Our superior elastic properties make this product the perfect solution for landfill caps, leach pads or potable water containment, where flexibility and elongation are most important. GSE LLDPE Textured geomembranes are the best product choice if you require increased frictional performance, flexibility and elongation. Our superior textured surface allows for increased friction between the two layers and the design of steeper slopes in landfill closure or leach pad applications.